So, I went to Sally Beauty Supply yesterday. I got two bottles of “Stripe Rite” nail polish. One white and one a bright orange . The polish itself is very wet, which makes it easy to use, but it dries pretty quickly so you aren’t sitting around, waiting for your nails to be reasonably dry. 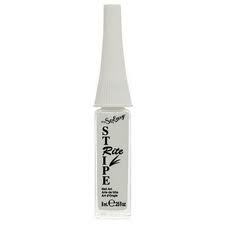 Another great thing about the Stripe Rite polish is the brush. The brush is super thin, so if you want to try an intricate design, the brush is perfect. But, it also works if you want to lay it on thick. Also, one dip is enough for about three lines. Another cool feature, is that if you make a mistake with the brush, you can correct that mistake with water or alcohol, without messing up the base paint! I know, it’s pretty amazing. Now, reading the label, it says to apply to sealed nails, or polished nails. Sealing you nails is really like adding a topcoat. Many nail sealers are a gel formula, typically high-gloss. They aid in preventing the nail polish underneath from peeling and chipping. Nail sealers can also be used as a clear polish. Another cool thing about Stripe Rite, is that the nail polish is made right here in Florida. Delray Beach, Fl, according to the companies label. I got my two polishes from Sally Beauty Supply on sale at 2.79 a pop, but they are usually around three, four dollars. It’s a great investment if you’re into nail design. And even if you just dabble, I recommend picking one up and trying it out. Who knows, right? Tomorrow, or the next day, I’ll post a pic of what type of design I created. Well, that’s it for now lovelies!